While it's fair to say I'm not the most qualified to judge President-elect Obama's choices for the Interior (I was never much for decorating) or the Treasury (as every other Thursday I'm lucky if I have enough money for lunch), but Christianity and poetry are two of the few things I'm qualified to critique. And, although I may have some bones to pick with Rick Warren about how he sometimes trades Truth for tolerance, at least he's promoting a theology that for the most part is based on the Trinity. 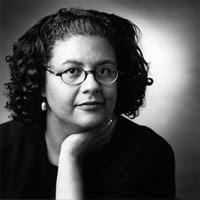 On the other hand, Elizabeth Alexander, Obama's choice to compose and recite the Inauguration poem, is probably far more revealing, for her verses elude to an intellectual elitism and black-feminist agenda that excludes Our Lord and Savior. is gaudy, mustard-colored poop, is..."
scarves from inside me... then a rabbit..."
Thus, although Alexander's words may be a bit more subtle than Reverend Wright's, Obama's choice of Elizabeth once again proves Barack is first and foremost black and elitist and secondly Christian, which of course really isn't Christian after all. And in the light of Barack's choice of poetess, his recent announcement that his administration will stress "science" (a not-so-subtle swipe at Bush's evangelical beliefs) now becomes not only ironic but eerie, considering his pseudo-scientific justification for the destruction of the unborn bears a remarkable resemblance to the "scientific" way the 19th Century European hot-shots treated the young "Hottentot." Yesterday, while reviewing Alexander's poetry, I also went back to reread the Old Testament's Song of Songs especially Chapter Two, Verses 8-14, which is the usual first scripture reading (except when the 21st falls on a Sunday) at Catholic Mass for that day. I was struck once again by the passage's Truth and Beauty (so absent from modern poetry), how love can be depicted so sensually without being overtly sexual or pornographic. Of course, the fact that Song of Songs is a love story between a man and a woman, not two of a kind, is essential (are you taking notes, Rev. Warren? ), but also that it's a love story that will end in total self-sacrifice for each other and the children. If God is not dead, then neither is holy poetry, and thus we must inspire our youth to be devoted not only to science and mathematics but reading and writing, so that some may come up with modern Christian classics to counter this New-Age pagan poop.